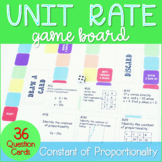 This product will help assess students ability to find unit rate from tables. 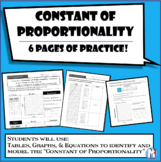 This helps to cover Common Core Standard 7.RP.2b. 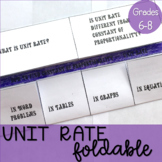 Students will evaluate tables to find the unit rate. 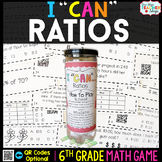 This product is most intended for independent use but could be used for class or group work. 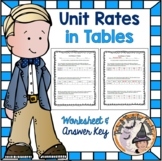 Unit Rates in Tables Worksheet created by Tricks and Treats for Teaching. 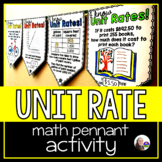 GREAT practice figuring Unit Rates in Tables. 1 page only. 3 word problems with tables to complete. 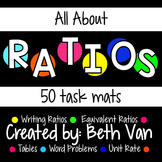 Perfect for Homework, Guided Practice, or Independent Practice.Be sure to L@@K at my other (525+) TERRIFIC teaching resources. 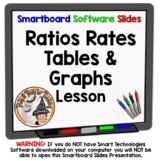 In this 45 minute lesson students explore representations of unit rate on a graph and explain the significance of points (0,0) and (1, r). 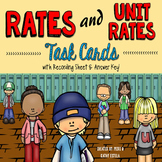 Includes a link to a math website with a problem for students to complete. 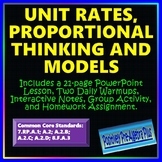 Aligns to Common Core standard 7.RP.A.2.d. 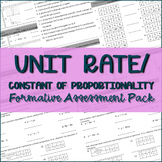 Guided notes for how to find the unit rate/constant of proportionality. 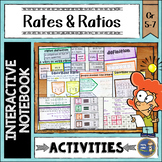 Students will use the formula y=mx and use tables and graphs to find m.
Worksheet to help students use tables and graphs to see proportional relationships. 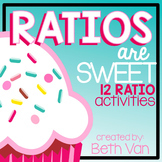 Constant of Proportionality (aka Unit Rate) Six pages of activities!